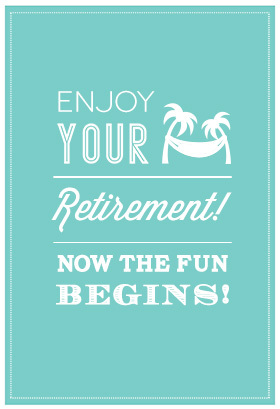 When someone retires it is common for friends, co-workers and family to send a retirement card and possibly a gift. This is to wish them well for the next chapter of their life and gives them the opportunity to let them know how important they have been to them and still will be as they carry on into retirement. This is usually achieved by writing some retirement wishes, funny quotes and sayings or even religious sentiments in the retirement card. However, it is not always easy to know the right words to use in a retirement card. Even the most skilled writers can struggle with finding the most fitting words or sentiments to express exactly how they feel towards someone they care deeply about. Do you write from the heart, stick to something more traditional, or maybe even introduce some humour? These decisions are not easy, and that’s before deciding on the actual words to use. The whole process can be far more stressful than it need be. That is why we at SomeoneSentYouAGreeting.com have written this guide to help with knowing what to say. We have taken it upon ourselves to help relieve the stress and worry about making sure your card message is just right, and so below you will find a whole range or different retirement messages and wishes that you can either copy directly and use them as they are or as ideas and inspiration for writing your own. We’re convinced you’ll be able to find something perfect for your situation and they will make what can be a daunting task much more simple. Congratulations on your retirement. We wish you tons of happiness in the years ahead. Congratulations, now the fun begins. Best wishes on your new chapter in life. Retirement opens the door to new opportunity. I can’t come with you in your new endeavors, but my highest hopes for your future can. Happy retirement. You are the kind of people that brings the best in others! Thank you for everything you did. Wishing you a life full of success and happiness! Having someone like you as a coworker has been no less than a gift. Wishing you a wonderful retired life ahead!! You will be missed, but never forgotten. Retirement isn’t all it is cracked up to be. It isn’t for us, anyway. Enjoy your well-deserved freedom and know you will be missed. Retirement will be a difficult time for you: no getting up with an alarm, no boring staff meetings, no watching the clock tick down those last, long minutes before quitting time. However will you manage? Retirement marks the culmination of a career spent achieving success in the business world and the genesis of a career in enjoying the fruits of that success. Happy retirement. As you retire, remember that you have left behind a legacy of encouragement, achievement and work ethic that will always be part of your coworkers. Congratulations. Now that you are retiring, how will you catch up on the office gossip? I suppose we could email you updates once a week! Congratulations on your achievement! All your life you were wondering why you tolerated an annoying boss and put up with irritating colleagues – retirement is the answer. Congratulations. Morning coffees will finally be what they are meant to be – relaxed and de-stressing. Happy retirement. Forget #ThrowbackThursday and #FlashbackFriday – now you have all the time in the world to lie on a hammock and think about the beautiful memories of your life. Congratulations on your retirement. Now you have no excuses for not having enough time for posting selfies with grandkids. Congratulations on retiring. Retirement is your chance to be true to your own self. It is an opportunity to pick up forgotten hobbies and nurture the little kid within you. After all, it’s never too late to start living the life that you have always wanted to. No more targets, no more goals, no more KPIs and no more meetings. All there’s left to do now is to unfurl all the happiness that life has in store. Congratulations on your retirement. The lights have dimmed and the cameras have stopped rolling. Life has yelled Pack Up, but there’s still time until The End. Congratulations. Retirement is the only time when you can have a life without having a job. Congratulations. No facades, fake smiles or charades – retirement is all about being who you are without a worry in the world. Congratulations. Don’t worry about setting a budget for your retirement. Just focus on setting a timelines to fulfill all your dreams. Congratulations. The first destination you should travel to after retirement is a beautiful, elusive island cut off from the rest of the world – it’s called Happiness. Congratulations. The main course of your life has been amazing. Now finish it off with a classic dessert. Wish you a happy retirement. Retirement is life’s way of giving you a second chance to turn over a new leaf. Retiring is like falling in love for the first time. Thinking about it gives you butterflies in the stomach and you will never know how it feels until you actually retire. Happy retirement. It’s okay to be sad about your retirement, but it is much better to be happier about the awesome days that lie ahead. Congratulations. Retirement is life biggest irony – you’ll get bored soon and start looking for jobs to do. You may have got many promotions throughout your career, but the best perks of your life star now as you spend more time with your friends and family. Congratulations on retiring. Just because the word tire is a part of retire, it doesn’t mean you actually have to tire of life. Have an awesome retirement. Stock up with lots of drinks, good music and delicious food – the biggest party of your life is about to start. Happy retirement. The best things in life come unplanned or unexpected. So why plan for retirement? Congratulations. Retirement is the moment when all your favorite colleagues turn into your best friends. Retirement is when you finally stop listening to your boss and start listening to your heart. Congratulations. Retirement is life’s biggest irony. You’ve got all the free time in the world to do whatever you like, but your aging body will probably refuse to do most of those things. Have fun! Retirement is not about giving up, losing yourself, slowing down or feeling old. Retirement is about enjoying the longest holiday of life. Farewell. Your career has earned you money over the years, but now you get to cash in on all the time you’ve earned. Spend it well. I am happy to see you retire at just the perfect time. Actually, any time is the perfect time to retire. You are one of the hardest workers I have ever known. You deserve a great retirement, but I know you will still keep yourself busy. This is the beginning of the rest of your life and the rest of your life. Congratulations on your retirement. Best wishes for an awesome retirement. Keep working hard, but be your own boss. Planning for retirement is like planning your first ever date. No matter how meticulously you plan, nothing will actually happen according to plan but you’ll still love it. Congratulations. Life tends to give happiness in installments – the biggest and best one being right up ahead. Congratulations on retiring. Retirement is like turning eighteen – you can’t figure out whether you’re young or old. Congratulations. Thanks for everything you’ve done for your colleagues and the company. Decades of hard work have finally culminated into a beautiful feeling called retirement. Pre-retirement means 9 to 5 under your boss. Post-retirement means 9 to 5 under your wife. Farewell. People retire because they reach a certain age, but businessmen like you can retire because they’ve reached the zenith of success. Congratulations. Don’t forget to spend a little of your extra time with us. We’re so happy for you! I have to be honest with you. I’m a little jealous. Just as your work has been long and satisfying, we wish you a long and satisfying retirement. Congratulations on your retirement! If you get bored, you know you can call and hang out with us. We’ll miss you. You are one of a kind and not easily replaced.You will remembered for the things that you did here. Thanks for your years of hard work and dedication. Congratulations on your retirement. Retirement is the working person’s wish come true. Here’s to finally getting your wishes granted! You can be taken out of the workforce, but the work force can never be taken out of you. I am confident you’ll never stop working on things you love to do. If you found happiness or fulfillment in the workforce, then it’s likely you’ll do the same now that even more possibilities are open to you. We wish you health and happy days in your retirement. We will miss your wisdom and experience, but most of all, we will miss the encouragement you have been to us. We wish you the happiest of retirements. I wish you a happy retirement filled with fun and happiness. Best wishes on your retirement, may it be even better than you ever imagined. Best wishes on your next adventure. Start listening to your heart… it’s the best gift you can give yourself when you retire. Congratulations. Retirement adds 5 days to your weekend! Enjoy it! One of the problems with retirement is that it gives you more time to read about all the problems of retirement.